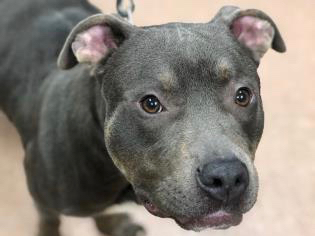 Blue is a one-year-old pit bull mix with striking looks and a lovable personality. His favorite pastimes include walking on a leash (which he does beautifully) and playing in our big yard. This high-energy boy could chase tennis balls all day long if you’d let him! Blue would do best in a home with no other animals or children. They just aren’t as interesting and fun as adults are to him. He has recently been working on basic commands and is picking them up quite quickly. In a very short time, Blue learned “sit” and he almost knows “paw.” Good-looking and smart, what more could you ask for?! Is Blue the handsome man for you? If so, please fill out our online adoption application or visit the Shelter. 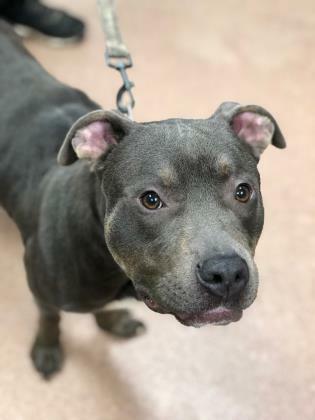 For more information about Blue and our other adoptable pets, please click on the Adopt menu above where you will also be able to complete our online adoption application.